I am looking forward to meeting you and I would like to say thank you very much for taking an interest in our school, a place of passion, hard work, and of course lots of fun too! It is always so exciting to start something new in your life, but it is not always easy to achieve one’s goals. It is possible for everyone to have a dream, but without patience, it is difficult for anyone to achieve their goals. Martial Arts are a way of life, not just physical actions. 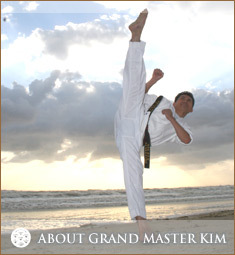 As we learn the movements of Martial Arts, we are all experiencing the “Journey of Life”. On this journey, you will learn your capacity of physical and mental strength. You will grow in positive ways, learning self-defense techniques and improving your self confidence. You will learn to release your stress and control your inner emotions. Each person’s experience is unique to them and you should challenge only yourself to exceed what you think is your maximum capacity. Finally, your commitment, dedication and patience will not only help you become a Black Belt Student, but will help you reach beyond your farthest goals. Life is wonderful and precious, and I hope you enjoy every day as you learn Martial Arts. As you may have heard me say “I am a teacher of Martial Arts and a student of Life”. Remember, a thousand mile journey starts with one step.